An interning folklorist in the field: documenting art cars in Kentucky. Just before finishing up her hours as an intern here at KHS, Folklife Intern Jenn Jameson visited Louisville to document the unique tradition of art cars. With fellow folklorist Joseph O’Connell, she shares the end product of a few hours doing fieldwork for the Kentucky Folklife Program. 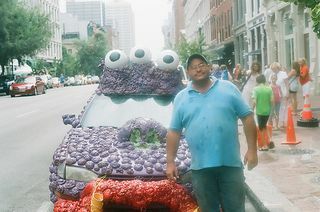 Oh, I love art cars! There is one in my town. I like the one pictured, even if it is a bit on the plain side.